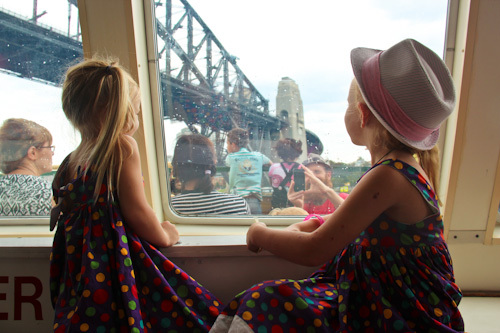 Sydney Transport is offering a terrific deal for families who want to get out and about on Sundays. For only $2.50 a ticket, families can travel on almost all public transport systems in Sydney — from Newcastle all the way down to Wollongong. This is such a good deal, we had to take advantage of it today. First, we took a bus into the city from Waterloo. We don’t know the bus system here, but we waited at the closest stop on Elizabeth Street and caught the first bus that came along. The girls love sitting in the back row of the bus. All the girls were wearing their beautiful purple, spotted matching dresses, so it was easy to spot them through the crush of people who were also riding the Sunday morning bus. A friendly man on the bus told us which stop to get off and accompanied us to where we could get to Circular Quay for the ferry. It didn’t take long for the next ferry to arrive. David picked Darling Harbour as our next destination, and it took us past Luna Park, an iconic amusement park. 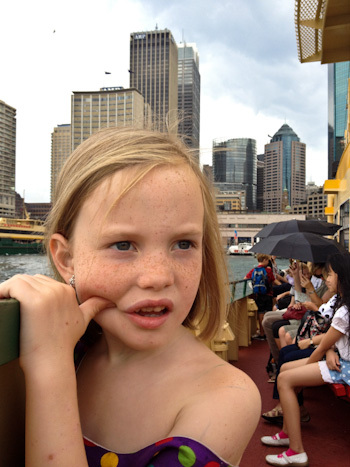 Watching the iconic Sydney scenery move past adds to the excitement of the ferry ride. Aisha chooses to ride the ferry on the outside deck, disregarding the wind and the spray as she soaks in the experience. 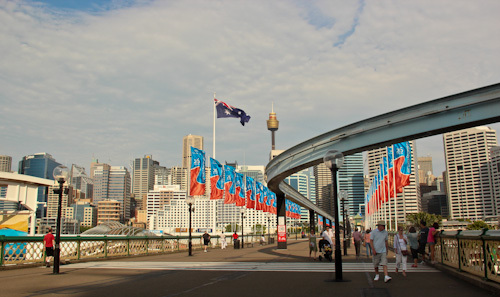 Darling Harbour is a waterfront destination with entertainment, restaurants and museums on offer. We spent most of our time here just walking around, planning the entertainment we would enter into on another day. We like seeing all the flags up in the city. They're celebrating Australia Day which is the 26th of this month. A short tram ride took us to Paddy’s Markets, which is modern shopping centre with a market feel. I remember visiting this part of Sydney many years ago when David first brought me here to see where he had lived for eight years. 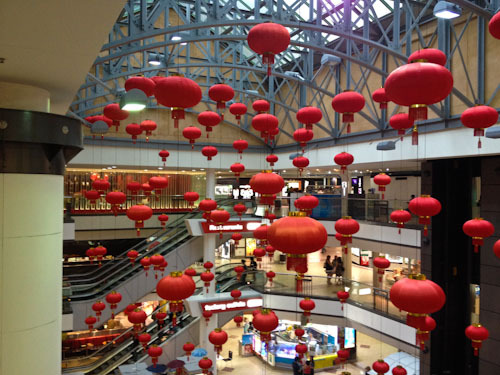 The interior of Paddy's Markets is decorated in anticipation of the Chinese New Year. On the top floor we discovered an amusement arcade. When Aisha picked up a credit card from the floor, we suddenly had $6 to play with. Most of the games were too hard for our girls’ age-groups, but Brioni enjoyed driving a car down a race track, and we all sampled gumballs from a machine. 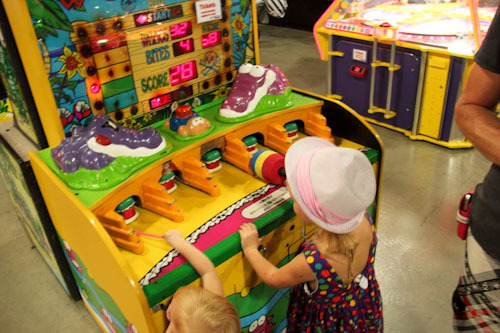 Brioni and Delaney try out one of the arcade games that is suitable for their ages. 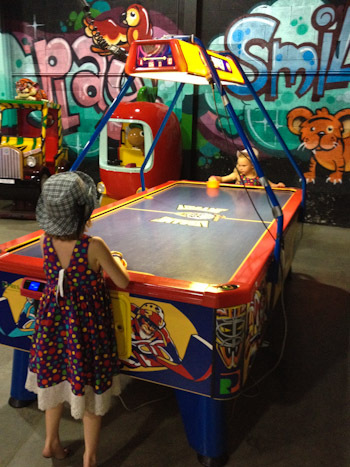 Aisha and Brioni tackle air hockey together. It was very late when we started heading back home. We ran outside to the tram station and managed to hop onto the next tram that was waiting for us. Later we discovered that it was going the wrong way. Riding the tram is very exciting! 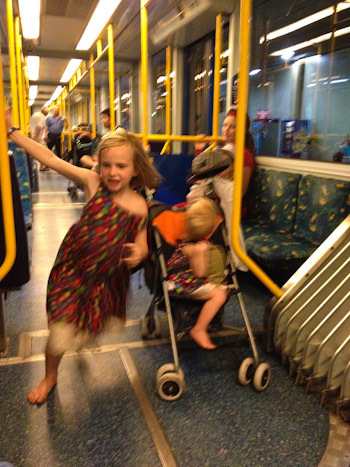 The best way to give your children an extra tram ride is by getting on one that's going the wrong way — like what we do! After we got off the tram, crossed the track and caught the same tram back to Central Station, we were properly on our way home. Redfern Station is a short ride from Central, and we waited in the station for the rain to subside before we could walk back to our truck. Our girls have adjusted to being out late at night and we all enjoy walking in the city at night time. The sky is never very black, there are always other people about, and yet the traffic is very light. Public transport is a wonderful way of exploring Sydney, and although it was after midnight when we got back, we enjoyed every minute of our day out! So glad you all are safe and happy! we have been missing our daily “blog” experiance the last few days wondering what you beautiful people were up to! LOTS OF LOVE from glenden brook!